This Thursday, the Dallas Convention and Visitors Bureau is launching a paid campaign on Facebook and Twitter to promote the city's first Snapchat channel. But rather than rolling it out with videos about barbeque and bars, Dallas is going Texas-big—and Texas-bold—with a campaign designed to woo LGBT travelers to the center of a politically conservative state. "Dallas is this blue donut hole along with other cities here that are Democratic," said Frank Librio, vp of communications at the Dallas Convention and Visitors Bureau. "So it's this blue donut hole in a red state, and when someone from the LGBT community gets here, they get it. Understandably, they're probably fearful of coming to Texas because it's a conservative state, but Dallas is much, much different." The promotion will run with a video feature about the LGBT community in Dallas. And the video will direct followers to the city's Snapchat account to learn about areas such as Oak Lawn—a neighborhood central to Dallas' gay population—and Cathedral of Hope, a United Church of Christ congregation that many gays and lesbians belong to. Followers can also watch stories about members of the LGBT community and submit their own for a chance to be part of a longer narrative video during September's Dallas Pride festival. The city has other plans for the platform this fall, including possibly buying geofilters for the city's entertainment districts. "We plan to slowly utilize Snapchat to engage that younger audience," Librio said. "We're putting our feet in the water, and after Dallas Pride in September, we're going to dive in and broaden it out to wider tourism messages and to use all the bells and whistles that Snapchat has to offer to engage a younger audience." It's been less than a month since Philadelphia's tourism department launched its Snapchat channel. Since then, it's created more than a dozen stories featuring Independence Day fireworks in the home of the Liberty Bell; clues for a beer-garden scavenger hunt; a celebrity takeover with chef Robert Irvine; and an invitation to model for Philadelphia tourism photos. "A huge part of what we do here is try to give an insider view," said Dana Schmidt, social media director for Visit Philadelphia, "when we can get behind the scenes of a visit or go on a VIP tour around the city to show people what it's really like to visit these places in Philadelphia." Last week, tourism employees snapped exhibits at a local museum and used the app's tools to doodle on each video. They also treated followers to a lighthearted tour of Society Hill, a beautiful historic neighborhood near Center City. "It's such a fun, informal way—it's really emoji heavy," Schmidt said. The city has been averaging 4,000 views per post over the past three weeks. And when it submitted a few videos for a Live Story on the app, it received 5.3 million views on seven snaps. When the Democratic National Convention begins later this month, the tourism bureau plans to shoot a series of interviews with local trendsetters and tastemakers. Philadelphia already has experimented with geofilters—paying a few hundred dollars to offer users a special filter when they enter a section of the city—and plans to make as many as a dozen more by the end of July. "We want to create a postcard feel for people who are visiting, whether it's for the DNC or not," Schmidt said. "They can get an iconic shot of Boathouse Row, for instance, and be able to take a snap of that and to be able to pick a filter that gives it a postcard feel. A vintage postcard." Back on the West Coast, the Los Angeles Tourism and Convention Board has been partnering with publications like Elite Daily—"The voice of Generation Y"—and bands like Børns. The board has run successful Snapchat partnerships with the Los Angeles Rams and influencers to showcase the city's diverse food and entertainment offerings. Next, the city wants to work with comedians. The partnerships are paying off, said Bill Karz, vp of digital marketing. He said that when Elite Daily took over its Snapchat channel for the initial debut, the city's stories quickly garnered 1,000 views. 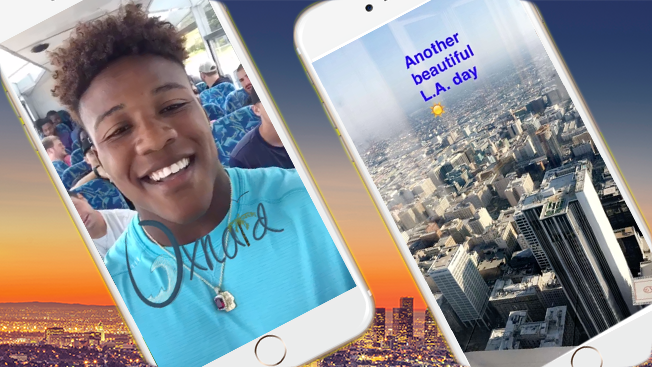 Now, Los Angeles is exploring the idea of partnering with as many as 30 hotels to create geofilters for each that are co-branded with "Discover L.A."
"You know how it is, that destinations aren't always the first to think of new concepts," Karz said. "We're not always the most innovative group of people, but I think as we dive into the digital age, you're seeing destinations get more and more savvy." Cities aren't the only ones pushing the platform. The Oregon Tourism Commission is using Snapchat to tell stories about every part of the state. To keep it fair, Emily Forsha, content and community manager for the commission, said the group keeps a running tally of how often it features each city on Snapchat. The Olympic track and field trials are in Eugene this month, providing a chance to talk about the history of the city as a running town. The commission has also snapped road trips to show followers where to get a burger and shake while driving through eastern Oregon. Last week, the state launched a new tourism campaign and gave Snapchat fans a sneak peek a day before the paid promotions debuted. And it's kicking around the idea of shooting a series of videos about wines from the region. "I think we kind of look at all of our social channels as an inspiration piece," Forsha said. "We're not selling anything directly, so we're going for inspiration through all of our social channels. I would say Snapchat is a way to leverage something that's live and happening now in Oregon. We can kind of do that on some other channels too, but the engagement on Snapchat makes sense for 'what's happening now' stories."